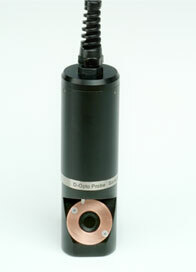 The Zebra-Tech D-Opto is an optical dissolved oxygen instrument. This is ideal for long term monitoring of dissolved oxygen in marine environments, as well as lakes, rivers and streams. In situations where there is a lot of bio-fouling, the D-Opto Shutter system is available to cover the sensor window and keep it clean when not actually making a measurement. This is controlled by the same data logger as is connected to the D-Opto sensor.